Previous articles looked at why Apple is now focusing on users, not units in Fiscal 2019, explaining why it's not an attempt to hide failure, even as it does remove data that has historically fueled misinterpretations of Apple's performance and direction. By focusing attention on the value of its installed base of users, rather than fluctuating unit sales of hardware, Apple is capitalizing on a unique strength: its ability to attract a vast, loyal following that's incrementally growing globally while driving sales of replacement hardware and accessories and allowing Apple to launch entirely new product categories (like Apple Watch and AirPods) and subscription services (like iCloud and Apple Music). Insanely, bizarrely, and to their own detriment—rather than successfully copying this, Apple's competitors have largely ridiculed the idea of having satisfied users. You don't have to be an Apple fan to recognize this is true. Decades ago, Apple's Mac users were denigrated as a cult because few of them would even consider buying a generic Windows PC. In the iPod era, Apple's fans were mocked for paying for music and buying premium hardware when cheaper devices existed. And since the debut of iPhone, generic smartphone users have lambasted Apple's ecosystem as a "Walled Garden" that limits freedom and locks its customers in. Everyone—even Apple haters—agree that Apple has attracted a different class of customer than Samsung, Xiaomi, Google, Microsoft or any other major tech brand. 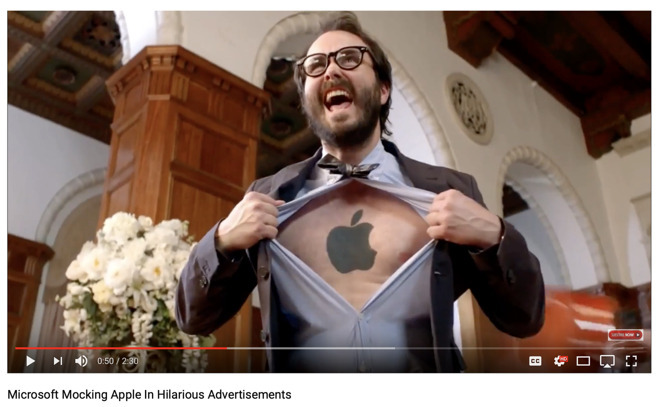 Those firms have even openly mocked Apple and its customer base in advertisements that ridicule Apple's fans for everything from standing in line for the latest new product to simply being part of a large mainstream user base—such as having white EarPods. What's so nutty about the consumer tech industry isn't that there is a luxury brand like Apple that has attracted lots of loyal users that love its products and the way it does business. No, the truly bizarre thing is that Apple has competitors who pretend that this is not normal. In any other market, attracting a significant client base of users is simply a sign of success and competence. There are car buyers who love Toyota or Audi or Ford. There are fans of Instant Pot, Disneyland, Starbucks, North Face, Armani or Chanel. All of these users pay a premium over a generic pressure cooker, visiting a lesser known theme park, drinking regular coffee, or wearing clothes that have no logos or premium brand name. Any company that can effectively establish a relationship of trust with—and appreciation from—a significant population of buyers is generally considered to be doing all the right things: developing a great product that consistently delivers an exceptional experience, and then being there to provide helpful support whenever something goes wrong. It's really only in the consumer tech industry that this kind of anti-exceptionalism exists. Cheapskate tech bloggers commonly recommend that users subject themselves to a more frustrating, less secure experience where their privacy and even safety are likely to be at risk, just to save some money. This is the PC nerd culture, where some individuals pride themselves on saving $100 here or there while spending hours of their own time on self-support and learning how to understand and manage a series of complex technical issues. That's fine for people who love tinkering, but for mainstream users in any industry, it's just not typical to expect to have to lift the hood of your car to make adjustments before you take off to drive somewhere, or to roast and grind your own beans whenever you want a coffee, or to sew your own clothes all just to save money as a do-it-yourselfer. For anyone whose time is valuable, "doing it yourself" is an expensive proposition. As personal computing grew from a relatively small group of technically savvy early adopters in the 1980s into a virtually ubiquitous role serving everyone from children to their grandparents and from auto mechanics to artists and politicians, the attractiveness of Apple's approach—to making technology work for "the rest of us" and curating the experience so that every piece of software worked similarly and was generally intuitive to get started with and become productive—has given the company a unique position. PC thinkers feel iPad needs to be more like a 1990s notebook. 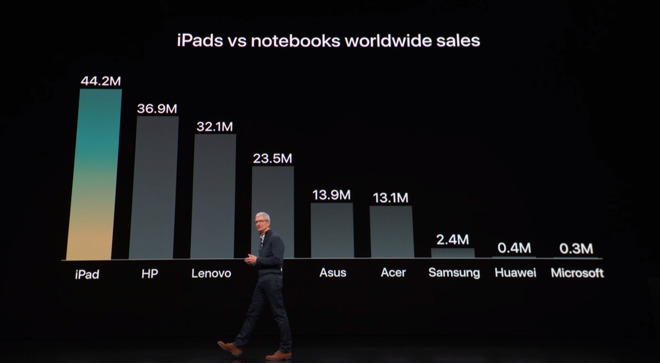 But Apple is outselling them. Apple's is the only computing platform that can claim to offer both a truly integrated experience across an ecosystem of devices and one that serves a billion people globally. There are some small boutique brands with fiercely loyal customers, and some mega producers who crank out huge volumes of unexceptional commodity, but nobody else has both the size and character of Apple. Unit sales measurements focused on quarterly market share suggest that Apple's position is perpetually one step away from doom, but when you look at the loyalty and resilience of Apple's customer base, it's clear that the company does not face any dreadful scenario at all, and that those really at risk are the firms churning out lots of units but failing to really create users. Microsoft came somewhat close to achieving Apple's current position in the PC market in the 1990s, but it fell down as its Windows platform became synonymous with frustration, security lapses and rough edges in places where Microsoft didn't really have control over the whole product. After once controlling virtually all of the personal computing market and substantially all of the primary software in use, from Office to its web browser, Microsoft now sits on the remains of the legacy PC platform plateau while the world has moved on to embrace mobile computing and a future of wearables where Microsoft isn't even a contender. The reason why: in Microsoft's world of Windows, if your PC crashed it might actually be Windows fault, or it might be your generic RAM, your commodity logic board, or some conflict between the software you installed, a virus, an unusual setting inadvertently made by you or some rogue code with free reign of the system, or any number of other variables that generally made buying an entirely new PC and starting fresh your best solution. That's a terrible way to maintain an ecosystem and an installed base of users who care about it. Apple not only replaced Microsoft as the OS platform for mainstream personal computing across multiple form factors but also took the place of all of Microsoft's hardware partners, as well as the absorbing the position of its former "WinTel" silicon partner Intel, by increasingly making its own mobile processors, to boot. At the same time, Microsoft under Bill Gates and Steve Ballmer did retain a solid relationship with developers and the enterprise, largely because it cultivated a close relationship with those segments. However, as consumers began voting with their dollars, the Bring Your Own Device movement undermined Microsoft's long-established relationships as the enterprise opened up to iPhones and developers began chasing the money in building mobile apps for iOS. Beyond simply taking over existing roles in the personal computing market as demand moved toward mobile devices, Apple also created the secure—and extremely lucrative—software market that Microsoft was unable to successfully create for Windows PCs. Apple has also adeptly expanded into new form factors of computing, from watches to audio and other peripherals that Microsoft wasn't very successful in introducing or selling to its PC user base. 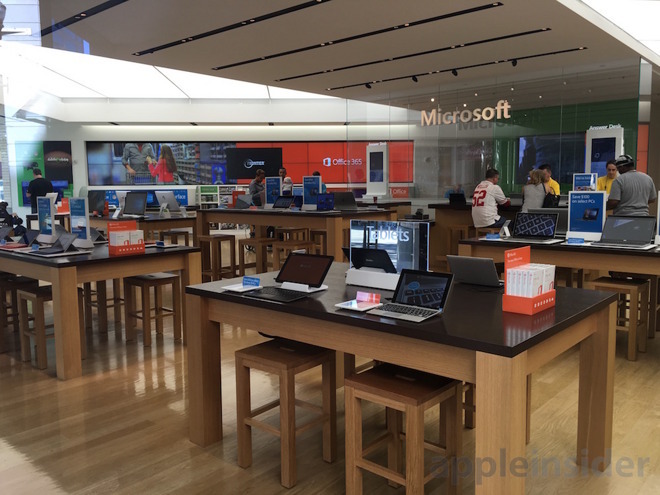 In the other direction, Microsoft has attempted to enter Apple's realm in hardware and with retail stores. If you walk past one of Microsoft's retail outlets, you can observe that both are quite pathetic attempts that haven't really gone anywhere in the last ten years but serve as a distraction from the company's vastly more profitable efforts in cloud computing and other ventures. Compared to the PC experience under Microsoft, Apple has created an ecosystem, platform and installed base of users that is not only far more profitable but also vastly more loyal and sustainable. Despite waves of intense competitive pressure from the entire world's PC makers, consumer electronics firms, phone makers, and most recently watchmakers and audio vendors, Apple is not in danger of bleeding away any significant number of customers—largely because Apple works to maintain such high user satisfaction rankings. 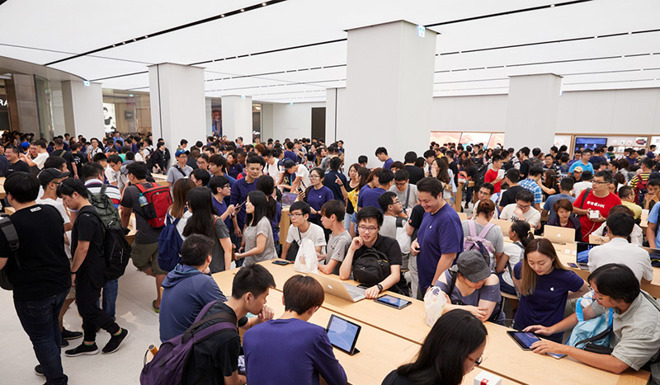 Is it obvious yet why Apple is focusing the attention of its investors on its true core competency, that of attracting and retaining an intensely loyal customer base? The number of units of each brand category that Apple sells its users each quarter is virtually immaterial. It could be one phone every year or two, an iPad, a new Mac, another Watch and a couple bands, or it could be just dozens of subscriptions to services that work on the iOS devices they've owned for years. After a point, units don't matter. The relationship does. With its massive installed base of satisfied users, Apple is already maintaining its position as the most valuable and most profitable tech company in the world even without being the largest vendor of conventional PCs, or the largest phone shipper, or the biggest headphone vendor or the largest music streamer. In fact, one way Apple is playing it safe in comparison to Microsoft is that it is not in any credible way creating a monopoly or impairing competition in a way that could expose it to antitrust violations. It's simply offering a more attractive product experience. That success also changed the nature of Microsoft. After taking over as Microsoft's chief executive in 2014, Satya Nadella terminated its mobile device strategy built around the acquisition of Nokia and shifted the company to support iOS development, further strengthening Apple's relationship with the enterprise and other developers and effectively reverting Microsoft into the Apple partner it was in the early 80s, compared to the rival it became in the 1990s. The installed base of Windows users is roughly comparable to Apple's installed base of iOS and Mac users—around the one billion mark—but Apple is generating far higher revenues and profits, and its successfully launching new product categories and selling huge volumes of premium hardware. Apple's billion-strong ecosystem isn't as large as the combined efforts of all companies making some use of Google's Android platform or some derivation of an Android-like platform. But Apple's users are vastly more valuable. They're willing to pay, on average, about four times more for an iPhone. They also buy iPads, rather than expecting to get a free Android tablet; they buy Apple Watches; they buy apps and subscriptions on a similar 4x multiple—so about half as many users are buying twice as much stuff in the App Store; they even buy premium Mac notebooks and desktops that have no real Android alternative. Google is struggling to sell Chromebooks the same way it ineffectually sells too few Pixel phones to matter. Clearly, there is some massive difference in experience between Apple and Android. Luxury cars might easily be four times more expensive than a basic sedan, but the luxury car market is also far smaller. iOS is not just a tiny blip of luxury. In markets that are strategically important and valuable, iOS is actually ahead of Android. 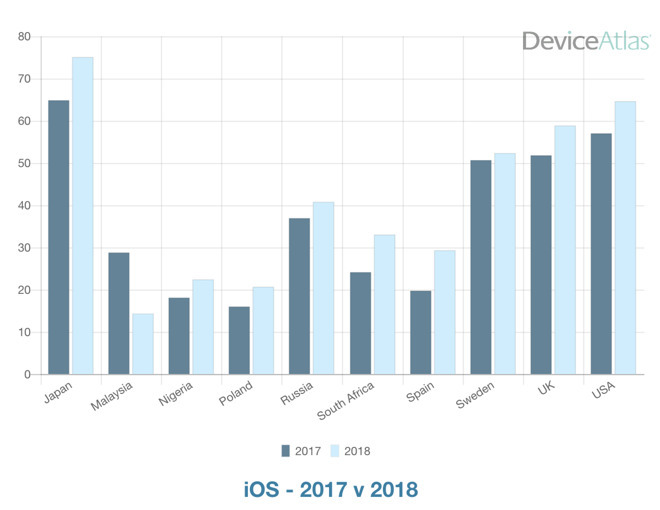 Apple's iOS platform is framed as being half the size of Android, but in first world markets, the iOS installed base accounts for the majority of mobile activity: 75 percent in Japan, 65 percent in the U.S., and between 50 and 60 percent in Australia, Canada, UK, Ireland, and Sweden. Apple sells most of the premium phones sold to affluent urban Chinese, and virtually all of the high-end hardware sold anywhere. None of this would be happening if Apple were simply charging more for the same product. Android, not unlike Windows, describes a small portion of the product experience connected to the devices that run Android. Like Microsoft in the PC era, Google has limited control over the typical Android-licensed experience and none at all in products that are counted as Android but use a custom AOSP variant that leaves off Google services, like most of the devices sold in China. When you look at Android in terms of money (and money is just a measurement of the commercial ability to accomplish something), rather than in terms of some ideological purity test or simple exercise in branding, it becomes clear that the Android "installed base" is more like a herd of cats. There might be a lot of them, but they're not of any commercial agricultural value comparable to Apple's corral of horses. Google can't sell any meaningful number of its supposedly huge "installed base" on its fancy Pixel hardware; it can't get them to upgrade in any sort of meaningful fashion, and it can't even sell a large percentage of them on its cloud services or software marketplace. And for most of China—the world's largest mobile device market—it's blocked from even offering its core ad-supported services. As with Windows PCs, the primary reason for people to use Android is simply because it is cheaper. And as soon as people can afford to escape the unpleasant experience they are stuck in due to a lack of funds, history shows that they do just that. As China's middle class began to emerge over the last decade, they shifted from Linux and Android phones to iPhones. Huawei, OnePlus and other Chinese makers with higher-end brands are seeking to create an experience that will captivate customers and keep them from defecting to Apple's iPhones, and those efforts may someday begin to see some traction. But we also have the example of Samsung, which has sold virtually all of the premium Android phones globally across the entire history of Android as a platform, yet it still struggles to stay marginally profitable because of intense pressure within Android to drive pricing downward. Today, rather than comfortably sitting on a large installed base of premium users, Samsung has told its investors it is working to enhance its middle tier phones in the hope it can survive intense completion from Chinese Android makers, even as Apple keeps focusing on higher-end iPhones and continues to comfortably earn virtually all of the profits from global handset sales. If Samsung, which has long represented about half of all Android shipments, couldn't build a defendable base of loyal Galaxy users, how can the sloshing tides of various Chinese mass producers support the creation of a loyal base of uses when there is such intense commodity pressure for consumers to shift to a cheaper brand—given that all of them are little more than iPhone knockoffs anyway? Without security or privacy or any of the other benefits Apple has sold its users on, Android simply offers individual licensees very little to build a differentiated experience that can withstand external commodity pricing pressures. And rather than even aspiring to support such a thing, Google's entire intent for Android is really just to have a platform it can infiltrate to spread its own surveillance advertising. Google has never been interested in building a premium business for any of its licensees. And although it would now like to have for itself what Apple has built over the last decade, Google has been wholly unable to build this for itself after ten years of incompetently trying with waves of its own Nexus and Pixel-branded devices that have each crashed in ruin. Google is now spending incredible amounts of money on custom Image Signal Processor silicon for its Pixel phones, resulting in awards and fawning media attention. But it's not resulting in real sales. And everyone else is also investing tons of money into computational photography, including Samsung, Huawei (on its custom Kirin chips), Qualcomm (on its Snapdragon chips it's selling to Pixel rivals) and of course Apple—which is maintaining a lead in video, Portraits, Augmented Reality and other imaging tasks, not just in creating nice still photos. While Android licensees often try to denigrate Apple, its premium pricing, and its installed base of loyal users, they are at the same time also desperately trying to look like Apple in an attempt to replicate its success. Even Google—which formerly introduced its own, very different vision of the smartphone and promoted ideas of open community development and decentralized innovation—has totally abandoned all notion of ideological Open Source purity to push out its own iPhone-copies using closed, proprietary camera features offered at the same premium prices of Apple, with virtually identical marketing and retail strategies. Just as with Samsung and Microsoft, all it took was years of failure to realize that its own ideas were worthless and that it needed to copy Apple to have any shot at success. Yet despite many strident efforts to be as much like Apple as possible, none of these companies—not even Xiaomi, the supposed "Apple of China"—have been able to achieve anything like Apple in building an App Store or services or selling accessory hardware, watches, headphones, or even tablets. A primary reason for the abject failure of Microsoft, Google, Samsung and Chinese producers (such as Huawei and Xiaomi) to replicate the success of Apple in building a powerful user base is that they have been coddled by the tech media into thinking that fawning media attention and an excited endorsement of misleading unit sales figures and "market share" are valuable. As the next segment details, they really are not—and certainly no replacement for building a relationship of security and trust with buyers.